So, lets say you got your grubby little hands on an ASHPD and modified it to work on moving surfaces. Now you place portals on these walls. And they start coming towards you. now these portals are place so well so that every part of your body can enter the portal with no obscurity. You just lost twenty dollars and my self respect. I suspect you would crush yourself. yes but how, trying to imagine how it would happen is hard. You'd be trapped in another dimension is my guess. What I meant was, you'd be stuck between yourself and yourself, and thus get crushed by yourself. prescisly why is unclear, but it explodes. Imagine when the width is less then your body but not totally crushed yet. Your left arm would stick out the right portal, you could slap yourself in the face. And your right arm would stick out the left portal. When your torso starts poking through both sides your left and right side of your torso will touch each other, and then the crushing starts. Or imagine that there are infinite yous to the left and right, like your looking at two mirrors lined up. But they all start moving towards you, until the you on the left and right crush you. Edit: The end result would be very similar to if there were no portals at all, except that you wouldn't leave any marks on the moving plates. Makes clean up easier. See alt text of xkcd 199. You would crush yourself. But you're welcome to try it yourself. Just let us know before you do, and if we hear nothing back we'll assume the worst. On a somewhat related note, I've crashed the game by placing two portals on the ceiling of a place where you have to duck to get through, and then standing up under one of the portals. Your head pops out of the ceiling, and you can see your feet standing on the floor, but you are upside down. The only place I could find to do this was on the final level. And like I said, doing this and messing around with it for awhile crashed it. A better question is what if you place a portal on a tablet, and another portal on a smaller tablet. If you put the first tablet into the second, what would happen? I saw this in a comic before, I just forget which one. tricky77puzzle wrote: A better question is what if you place a portal on a tablet, and another portal on a smaller tablet. If you put the first tablet into the second, what would happen? I think for the sake of avoiding nonsense, the two portals have to be the same size and unable to enter each other. Not true. You can certainly have differently sized portals. Repeatedly passing an object through the two portals shrinks or grows the object. What if you have the portals both on pretty much portal-sized tablets, and then stick one through the other sideways/longways? The x axis of portals is smaller than the y axis, so it would work. And be confusing. niolosoiale wrote: So which side of the fence would you say I'm on? Why? The confusing one. I think you should pick a different fence. [center]I think a better question would be what would happen when the portals (of the same size) touch each other, whether or not there is a person/object traveling through them. 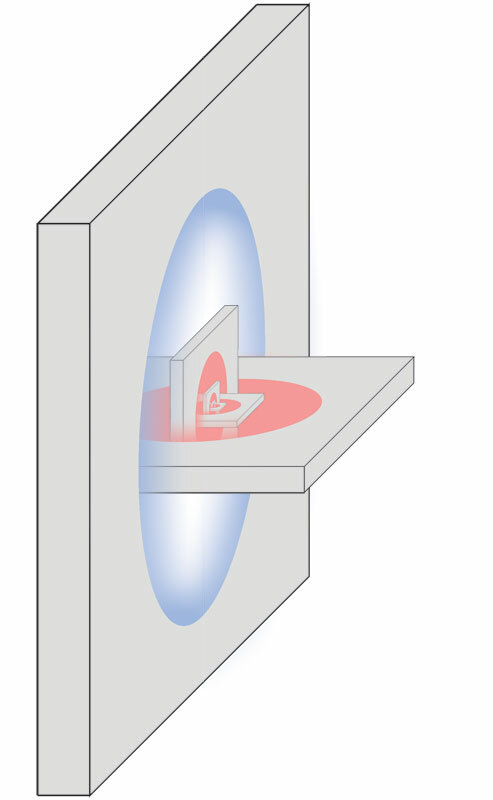 Here's a question, in the situation described by the OP, when the two portals are close enough that the person begins pressing on himself, do the tablets that the portals are on feel a force pushing them apart? Initially, it seems like there would not be, because the person does not touch the tablets, and the portals are sort of like a hole in the tablets that the person is going through. Also, I was considering Newton's third law (equal and opposite reaction), but the force of the left side of the body on the right side opposes the force of the right side on the left side, so this works out. However, thermodynamically, it's a little trickier. Consider a box filled with an ideal gas. Four sides of the box are solid walls and two opposite sides are portals. The two portal-walls are pushed inward. Assuming this is a quasistatic, isothermal process, the relationship (initial pressure)*(initial volume)=(final pressure)*(final volume) should hold. This seems to indicate that the pressure should increase as you decrease the volume. However, the increase in pressure is usually due to an increase in the frequency of collisions between particles and the surfaces. Here, the particles are unable to collide with the two surfaces that are being pushed inward. They will be more likely to collide with other particles, though. Not really sure what all this implies. The right side of the persons body is doing positive work on the left side of the body. However, the work done by the left side of the body on the right side is also positive. Therefore, there is net positive work being done on the person. The only place this could come from is the tablets which the portals are on. This indicates that there would be a force resisting the tablets being pushed together. I know that trying to apply real physics to portals is absurd, given that they violate the most some of the most fundamental principles of physics (mainly conservation of energy). Still, interesting to think about. HenryS wrote: Not true. You can certainly have differently sized portals. Repeatedly passing an object through the two portals shrinks or grows the object. this happens if you are holding both boards still. what happens if you let go of the horizontal one? what happens if you twist the horizontal one? I'm wondering about how the portal gun itself works too. can it shoot through liquids? are the portals always the same shape? telcontar42 wrote: Here's a question, in the situation described by the OP, when the two portals are close enough that the person begins pressing on himself, do the tablets that the portals are on feel a force pushing them apart? It makes sense that they should. Imagine that instead of pistons behind the two plates, you've got just your hands pushing them together. And between the two plates, rather than a person, there is a very hard, solid object like a diamond. If there is no force exerted on the plates, then by clapping the two plates together you should crush the diamond to powder. This seems absurd. It should take some serious energy to do that. Then again, portals obviously violate the principle of conservation of energy, since you can create a loop that allows you to extract arbitrary amounts of energy from the earth's gravitational field. ++$_ wrote: If there is no force exerted on the plates, then by clapping the two plates together you should crush the diamond to powder. This seems absurd. You've got a gun that can create some sort of wormhole, and this seems absurd? Talamor wrote: You would crush yourself. But you're welcome to try it yourself. Just let us know before you do, and if we hear nothing back we'll assume the worst. This (and alt-text to /199 ) lends itself to some interesting possibilities. Could you, for example, go down on yourself? More importantly, what happens as the two portals approach to the distance of the planck length? Tompkins818 wrote: What have I done!!! Well, I'd have to file this one under S for singularity. Mass occupying an infinately small space? We're into quantum country. Red Hal wrote: Could you, for example, go down on yourself? ++$_ wrote: Then again, portals obviously violate the principle of conservation of energy, since you can create a loop that allows you to extract arbitrary amounts of energy from the earth's gravitational field. Could suggest that portals can only exists at areas of equal energy? This would mean only at the same altitude for gravity, but might get complicated when we consider other forces. (For that matter, do field lines/virtual particles go through portals?) Or perhaps after going from a high portal to a low one you would come flying out at higher to speed to conserve energy. Also, what is at the edge of a portal? That seems like a very unwormholelike edge in space... reminds me of the windows in The Subtle Knife; I used to wonder if the edge would split an object, only letting half go through, or act like a solid but infinitely thin window frame. Those portals were in midair, though; I suppose portals on a surface always have a solid frame. It doesnt make sense that the tablets could ever make contact because that mass cannot stay in the space provided by the portals. for example your left shoulder would push into your right through the portal thus pushing you into your right shoulder more. even if it were to crush you into just tissues or even atoms you would still have forces acting on each other that would produce the same result. It would increase the force infinitely. This is impossible. there would have to be a force pushing back on the tablets the portals are on. The only way this can be avoided is if you splat out the sides and your matter goes all over everything in a very gross way. Delicious. phlip wrote: Re: Pushing a portal through another portal. OK, so say we do it in the way Xanthir mentioned. We put the orange portal on the wall, with the usual orientation, and the blue portal on an oval-shaped piece of wood, which we hold such that the major axis points toward the orange portal ("bottom" first), the minor axis is vertical, and the opening faces left. Now, as we start shoving the blue portal through the orange portal, the bottom of the blue portal will stick out of the middle of the blue portal. It will be horizontal, opening down (if you stick the blue portal into the orange one "top" first, then it would be facing up. Interestingly, whether you hold the blue portal so it faces left or right would have no effect here). For convenience, I'll call the part of the blue portal that hasn't gone through the orange portal yet (the part we're holding) just "the blue portal", and the part of the blue portal that has gone through the orange portal "the second blue portal". As we get the blue portal close to halfway through the orange portal, the second blue portal will have stuck out far enough to not fit through the orange portal, and will hit the wall. As you keep pushing forward, you'll feel something lifting the far end of the blue portal (the image of the wall as viewed through the orange portal is moving up, and the far end of the blue portal is resting on it). As the blue portal angles up, the second blue portal will angle towards you. Since the plane of the blue portal is still vertical, the second blue portal will also rotate to match the first blue portal, around the left-right axis (that is, your left and right, not any of the portals'). I'm not sure what will happen after this... the second blue portal is no longer perpendicular to the wall, so I think the forces will try to rotate it around its major axis... which'll do the same to the first blue portal, which'll twist it to be no longer vertical, and then the second blue portal will be sticking out at a strange angle... the 3D visualisation section of my brain is shutting down. As for being crushed between two portals: moving portals while things are sticking through them = major brain destruction. Picture this: Two portals, both on mobile panels on the roof. Throw the end of a rope up through one, catch it as it comes down from the other... and tie the ends together. We then have a loop of rope, hovering in the portals - it doesn't need to be supported by the edges of the portals, it can be isolated in the middle. Now, slowly move the portals apart. What happens? What happens if you rotate one of the portals? Do both at once, while pulling on the rope? For those of you now with broken brains: I apologise. However, consider the simpler case of one stationary portal, with an metal pole anchored nearby, and sticking partway through the portal. The other end has part of the pole sticking out... and if you move that end of the portal, the part of the pole sticking out will also move... so if the portal is mobile, it must be able to convey a force to the objects partway through it... so, conversely, by Newton's 3rd law, the objects partway through a portal must be able to convey a force to the portal. If you were to pull on that pole in my example, you wouldn't be able to pull it through the portal (since it's anchored at the other side), but you should be able to move the mobile end of the portal (it would behave as though the mobile portal and its end of the pole were both mobile, but attached together as one object). Similarly, if you're being crushed by two portals, when you start being crushed between your portalled copies, you would start applying a resistance (the reaction force to the compression), which should propagate back to the portals, and thus to the crusher. I'm pretty sure the force required would be the same as if you were being crushed between the two things, without the portals on them. Last edited by phlip on Tue Oct 14, 2008 4:45 am UTC, edited 2 times in total. There's nothing stopping the objects holding the portals from moving closer together, since all the repelling forces being applied by the object that's being crushed down are being applied to other parts of the object. So I think the thing would collapse into a singularity. This shouldn't be terribly surprising, since it's not like portals obey the laws of physics normally anyways. But if we are going to say that portals don't follow the laws of physics so they can do anything then is there a point to this discussion? I think that discussion of the physics of portals cannot ignore that certain fundamental laws of physics are broken. For the sake of interesting discourse, we should consider which laws specifically are broken and which laws can still hold. If portals were discovered tomorrow in the real world, how much of our understanding of physics would need to be thrown out and how much would stay intact? The most obvious law that is broken is conservation of energy. A portal can move an object from a location of lower potential energy to one of higher potential energy, with no change in kinetic energy. The only way that this can be reconciled is if the portal has some sort of energy source. It can give energy or take away energy from an object passing through it, depending on the relative potentials of the two portal locations. Also, it seems as though portals allow matter to travel faster than c, but they may not. Travel between portals seems instantaneous, but maybe it's just so fast that it seems instantaneous. The only way I can see for this to be true is if there is a certain width to the portal, so if you stick your arm through, part of your arm is on one side, part is on the other side, and a small part of it in transit. This seems unlikely but its the only way I can think of for portals to not allow for ftl travel. My understanding is that no actual ftl travel takes place as the object never exists in the space separating the portals. The portals make sort of a wormhole, but with nasty sharp edges, so objects going through a portal smoothly appear at the other one. The problem is, portals like this should transport fields like gravity or electromagnetism, which would really screw with space. The whole infinite freefall thing gets screwed up beyond the whole x > x thing, there might be infinitely many overlapping fields in the same space that might converge to something finite or might not, I don't know. davetp425 wrote: My understanding is that no actual ftl travel takes place as the object never exists in the space separating the portals. Still the whole idea of light cones goes out the window with portals. You can get an object a distance x away in time < x/c. This seems problematic to me. Maybe just because its been ingrained in me that it should not happen. I think light cones are still sensible things to think about, they're just not particularly cone shaped. You could have the portal do a sort of delay thing, which didn't violate c and which didn't have an "internal length" thing, but which did make some parts of a thing "not exist" for some time, and "double exist" at other times. Also, I think you don't ever get field strengths that are infinite, because fields propagate at c, so even if you have a wire with current passing through it, which has magnetic field falling off as 1/r if I remember correctly, between two portals, the magnetic field around it will be finite but always increasing as t->infty. And probably quite a weird shape to that field, too. telcontar42 wrote: You can get an object a distance x away in time < x/c. It depends on how you define distance. If by distance you mean the shortest path through space then the shortest distance may be through a portal; the portal just connects two previously separate parts of space and makes them just as adjacent as what we normally think of as adjacent. If you close your eyes and go through a portal you won't really notice that you appear to have teleported, and the whole time you'll have been going less than c.
jestingrabbit wrote: I think light cones are still sensible things to think about, they're just not particularly cone shaped. jestingrabbit wrote: You could have the portal do a sort of delay thing, which didn't violate c and which didn't have an "internal length" thing, but which did make some parts of a thing "not exist" for some time, and "double exist" at other times. That seems to make this even more complicated; we just have to remember that creating a portal between two places decreases the distance between the places. It's not a teleporter, it's a wormhole. jestingrabbit wrote: Also, I think you don't ever get field strengths that are infinite, because fields propagate at c, so even if you have a wire with current passing through it, which has magnetic field falling off as 1/r if I remember correctly, between two portals, the magnetic field around it will be finite but always increasing as t->infty. And probably quite a weird shape to that field, too. A variant: Take either two exceptionally large portals or one exceptionally small person so that the subject is less than half as tall as the portal, place the subject nearer to one end of the "entry" portal (say, on a focus), and rotate the "exit" portal 180 degrees around the x-axis, for a sort of portal 69. Would you crush yourself, enter sort of infinite lateral slide throught the portals (going from the bottom of A into the top of B, exiting out in the top of A and going into the bottom of B, exiting out the bottom of A, etc. ), or something else? Or if you replaced the person with an Inanimate Carbon Rod and slant it, would it fill an entire vertical chunk of the portal, like a slice of a compressed spring? These are the questions, man. davetp425 wrote: It depends on how you define distance. If by distance you mean the shortest path through space then the shortest distance may be through a portal; the portal just connects two previously separate parts of space and makes them just as adjacent as what we normally think of as adjacent. If you close your eyes and go through a portal you won't really notice that you appear to have teleported, and the whole time you'll have been going less than c.
Yeah, I like this explanation. Cauchy wrote: There's nothing stopping the objects holding the portals from moving closer together, since all the repelling forces being applied by the object that's being crushed down are being applied to other parts of the object. So I think the thing would collapse into a singularity. This shouldn't be terribly surprising, since it's not like portals obey the laws of physics normally anyways. More specifically, it would become a PANCAKelarity. Well, assuming they hit at the same time, I'd imagine it would be the same as being sandwiched by two copies of yourself. As soon as the portal make contact, you'd feel your left shoulder ramming into your right shoulder (assuming you're facing perpindicular to the walls path), and vice versa. So whatever the sum of the two walls speeds' are (whether they're equal or not), that's how fast the impact would feel. You would never actually go through the portals, you'd just touch them. So, you might end up just getting knocked to the side out of the path of the two walls (if you're lucky). And if this were being prevented, like for instance, if it was two infinite, parrallel planes of portal, assuming that the walls wouldn't stop for any reason (and that they wouldn't pass thru eachother), you'd be crushed by your own body (times two). There would be a very thinly spread out mass of guts inbetween the portals (as thin as the largest molecule in your body). afarnen wrote: There would be a very thinly spread out mass of guts inbetween the portals (as thin as the largest molecule in your body). I have a problem with this. What is stopping the walls at this point? Well the thing about the guts really has nothing to do with it. Once the mass in between the two portals cannot be broken down, compressed, etc. any more, the walls could not keep on going. It's like two identical indestructable spheres moving with equal and opposite net force, toward another identical sphere in the middle. As soon as all three spheres make contact, the net force of all the spheres would be 0. I'm not a physics teacher. So please don't take my word for it. I'm just doing it how I think is right.